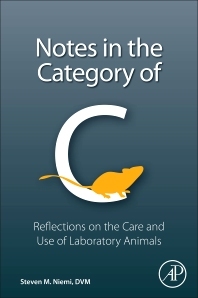 Notes in the Category C: Reflections on Laboratory Animal Care and Use addresses how to improve laboratory animal care and use, also characterizing the current state of the industry and speculating on its long-term future. It offers analysis from a professional who has spent a lot of time in the trenches, also highlighting new approaches to produce further advances in the field. As the proper care and use of lab animals is critically important to scientists and those who depend on data generated from those animals, this comprehensive book is an ideal resource on the topic. Physicians, patients and their families, consumers, federal and non-profit research funding entities, health advocacy organizations, the FDA, EPA, regulatory approval agencies, and companies that invest billions in R&D to create new diagnostics, drugs, vaccines and medical devices will find this an informative addition for their work. Steve Niemi is Director, Office of Animal Resources, Harvard University Faculty of Arts and Sciences. With over 35 years experience in biomedical research and commercial biotechnology, he has held senior management positions in contract drug and device development, biotech start-ups in human gene therapy and food animal genomics, and laboratory animal care and assurance.